Our friends in Arequipa, Peru held their annual camp in January, and they thought you might like to see how they got on. We thank you for your prayers for the wonderful time we had together. Please click on the video and enjoy! 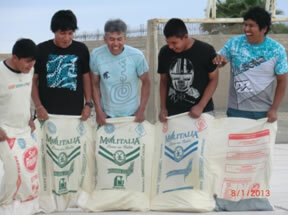 For more details about our work, or to support us, email us arequipa@gracebaptist.org.uk. Many an athlete has been disqualified for “jumping” the starting gun. As believers we are often like the athlete, devising strategies before first seeking counsel of the Lord. Seeing the enemy thwarted is the Lord’s work but He calls us to play our part, firstly through persistent prayer, pleading with Him to open doors, and then when He does, we must act promptly and with courage to face the spiritual battle ahead. The battle is hard but Roxy and I are much encouraged as we seek to support the leadership of the church at Buenos Aires, Arequipa. Please pray with us that the following prayer items will bring glory to God alone as we see His church grow. 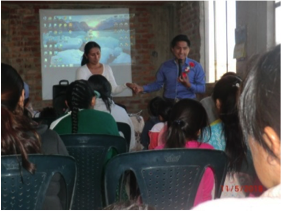 Please pray for Juan José, and Jessica Cuadras, two of our young people reaching out to students in the local University. Before going on to the Campus for daily personal evangelism, they meet for prayer at 6.00 in the morning. 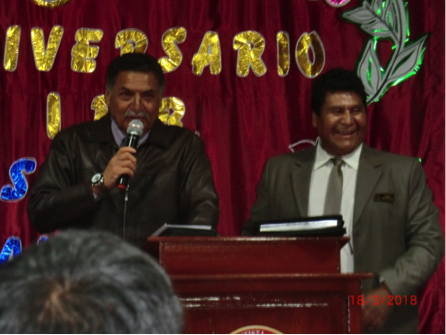 Recently they travelled to Chile for a conference, and in their report to the church, not only was their own personal zeal for evangelism evident, but also that they were encouraged by the zeal of the Chilean churches. Juan has preached a few times in our church; pray for his spiritual growth as well as for others who desire to serve the Lord and use their gifts. Please pray for Roberto, who has responsibility within the fellowship. He recently returned from a conference aimed at helping those facing marriage problems. He has a number of friends who are facing such trials and so has a burden to reach them with the Gospel. He currently hosts a meeting in his own home, but we are just waiting on the Lord to see if this is a further area where we can offer support. Just recently the wife of one of our young couples asked Roxy for some advice. Could our home be used for this much needed yet sensitive area of ministry, or do we continue meeting at Roberto’s? Please pray for clarity in decision making. Please pray for us as we consider developing church house groups. A year or two ago, Pastor Carlos and myself attended a Conference led by a Brazilian Pastor, examining the issue of growing the church through house groups. Churches around the world have grown exponentially through such ministry. Pastor Carlos has sourced some good material to use, and, apart from deepening fellowship, he seeks to prepare some of our younger men for leadership of these groups. Pray that this preparatory teaching will be greatly blessed by the Lord and that wise and clear structures will be in place before they begin. Pray for Roxy and me as we, alongside Carlos, pay periodic visits to the groups to encourage the continuation of vision and focus. Pray also that new converts can be readily and wisely fed into the right group. Rejoice with me over the inconvenience of a flat tyre! Dealing with a flat tyre gave me an opportunity, for over an hour, to share the gospel with Emerson. I was able to give him the booklet, Reasons to Believe, and he has asked to meet again soon. Please pray that I might be able to point him to Christ, I feel he is not far from the kingdom. Please pray for Ismael, 12 years old and the nephew of one of our members. He is due to have a serious heart operation this month in Lima. Pray also for his mother, who attended the church recently, and for the whole family at this time. Please pray for Samuel as he leads the young people’s meeting on Saturdays. Pray for those unsaved who attend. Please pray earnestly for Nancy, Pastor Carlos´s wife who is undergoing radiotherapy treatment for her cancer. Pray that the Lord will provide the funds necessary so her treatment may continue. We are encouraged by the prospect of more baptisms. Please pray for Carlos as he leads these classes and that the candidates may grow in grace and knowledge of our Lord Jesus Christ. As shared in our May Prayer Letter, the outreach work at Villa Magisterial is now under the direction of the church at Buenos Aires. This has given it fresh impetus, not only in prayer but in help and support from church members. Their attendance, from young and old, has brought a more lively spirit to the meetings. Please pray for the opportunity that this work gives for some of our young men to develop their gifts. Please pray for a special evangelistic outreach on Father’s day, 17 June. We long to see more fathers converted. Please pray for Vilma, who recently expressed her desire to receive the Lord as Saviour, and for Walter, whose wife attends the church. She says he has heard the gospel from some work colleagues, and desires to meet with us in the near future. Please pray for our financial support. Recipients of our prayer letters will know we have never mentioned finance, until more recently. However, given the significant shortfall in the level of our support, there is a real need for an increase in giving if we are to achieve the required 100% designated giving. Clearly we must first look to the Lord, yet we are deeply grateful to those who have already pledged additional monies. If what we have shared has encouraged your heart and you feel you can give, either new money or make an increase on your already valued contribution, that would be greatly appreciated. Gospel truth is impacting Peru, we are so happy just to be part of that growth but equally we desire that you partner with us, sharing in the joy of seeing Christ’s kingdom grow, and all to His glory alone. We do appreciate you all, both as a family and as a church, for your prayerful support for the work here in Arequipa. Those words spoken by the angel of the Lord ring from eternity past, into the present, and on into the certain fulfilment of all Gods purposes since the dawn of creation; a sure beacon of hope in a world torn by sin, suffering and human misery. He will save his people, and he is today saving his people among the nations, as the Kings return is ever nearer on the prophetic horizon. This sure hope cuts through the superficial, effervescent, materialistic celebration the world calls Christmas, where the baby Jesus is always kept in the crib! But his coming to reign as King is the hope of the church; when sins reign will come to an end. As the Spirit and the bride join together, saying and pleading, come Lord Jesus to end earths sorrow and misery. May the light of Christ by his Spirit be pleased to shine into some dark hearts at this season, and bring salvation according to his word. We pray that the Lord will make you all fruitful in every good work, and that the New Year will bring joy and new life for many to the Glory of God. We take this opportunity to share with you some news of the work here in Arequipa, grateful as always for your prayers and on-going support. We have recently linked up with the “Baptist Theological Centres” based in Lima. They have various centres in different cities in Peru, and are looking to expand their influence of ministry in the country. Therefore, we have given over the use of our church facilities to open a centre in Arequipa, for studies on a regular basis. The idea is to run studies every couple of months here in Arequipa during the year, for Pastors and students from different local churches. Pastors travel to Arequipa and run intensive classes for a full week to cover the various courses and studies on offer. It has been a blessing to have fellowship with other Pastors and students, and to pray for one another and our various ministries. It is so different and refreshing to gather with a group of fellow believers who have a hunger and thirst for God´s word; as in the church there is often only a remnant living and serving among the spiritually apathetic! The first two courses have been well attended, and no doubt as news spreads, the numbers will increase further in the future. We would ask you to pray for “Gustavo”, a Pastor from one of the largest Charismatic churches in Arequipa, who recently came to understand he was preaching a false Gospel. He has attended the first two studies, and now has a tremendous opportunity to preach the Gospel in his church, as he continues to grow in his walk with the Lord. The blessing is that he has no elders or deacons to oppose his ministry, so therefore, he now has a congregation of over 400 to reach, teach and influence with sound doctrine. I have started a bible class on a Saturday morning in the church to encourage deeper study and discipleship in the church. The two couples who have attended are really keen, and they have also attended the theological studies during this year. The main prayer need should always be for the success of the Gospel through all the various ministries; prayer for those who come week by week to the meetings, seemingly unmoved by the preaching of the Gospel. As John Calvin once said: “That the restoration of the Church is the work of God , and no more depends on the hopes and opinions of men, than the resurrection of the dead, or any other miracle of that description. It is the will of God that his Gospel be preached, what the success will be is not ours to inquire” There are often more unsaved among us; pray on for the miracle of New Birth and conversion. Some names to remember in prayer: “Edwin”, was recently in hospital, and attends when he is not working as a security guard on Sundays. He is very friendly and thankful for the support he has received; pray that future visits at his home will be used of the Lord to speak to him personally. “Javier, Patti, Maira”, a family that has been attending regularly, but, as yet, show no evidence of any stirring or concern. Ephraim, who works in a copper mine, attends with his wife, but both show no signs of personal faith and trust in the Lord and his word. What is lacking for those and many others? We need to pray that the experience of the Apostle Paul may be a personal reality in the churches of Christ. For our Gospel did not come to you in word only, but also in power and in the Holy Spirit and with full conviction (1 Thess 1: 5) In word only is not sufficient; we must have Holy Spirit power in conviction leading to full assurance! The ministry in “Lucresia´s” home had to be suspended for a couple of months, due to her suffering a long period of ill health, starting with Pneumonia! The family breakfast had to be cancelled due to the colder mornings, with her obviously unable to prepare the porridge at 5.00.a.m! The ministry also provides some support for her personally, and we have sought to help her over this very difficult period with medication to help her back to health again. The Christianity explained course also had to be put on hold. I have been invited to preach at a local church near to Villa Magisterial, and the Pastor there has kindly offered to help with a group from his own church in Evangelising the area. This kind of reciprocal Gospel partnership will give further advance for the Gospel in the area next year. The idea is to visit all the homes, to invite them to take part in the Evangelistic studies. With the help of the Pastor, “Carlos Pezutti”, and the help of others, we can hopefully cover the whole area in a shorter time period. 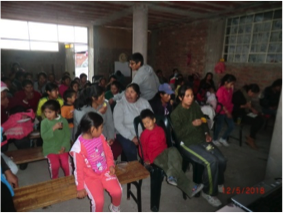 With us being well known now in the area, and the building of trust through the children´s club and family breakfast, the purpose next year is to pray for a spiritual harvest from among those who have heard the Gospel over the last couple of years. The other children´s ministries in both the church and San Pedro continue, run by Ronny and Rocio, on Saturday and Sunday respectively. As I write this there is just a couple of weeks until the school year ends. Our daughter Melissa has been studying in the University here in Arequipa since September, taking six exams up until December. She recently took her final exam, finishing top of her group, so DV, she will begin a five year course in the University next year, to qualify to practise as a Veterinary Surgeon. This year was my 20th year here in Peru, and next year will be our 20th wedding anniversary! Where have the years gone? Another milestone during the year was having my first book published in the US, which should be out early in the New Year. We want to take the opportunity to thank you all for your prayers and support for us over the years, and we trust you all have a blessed Christmas and spiritually prosperous New Year. At that time Jesus said, I praise you, Father, Lord of heaven and earth, that you have hidden these things from the wise and intelligent and have revealed them to infants. Jesus knew what it was like to have his words and works rejected by men. The people in the surrounding villages of Chorazin and Bethsaida had seen his miracles and heard his teaching, but did not repent. However, the disappointment and rejection did not for a moment dampen or interrupt joyful communion with his Father. Of course we are not so perfectly wired to the Divine nature to be able to live in interrupted joy, but it does give us a window into how the Sovereignty of God in the human life of Jesus was so beautifully expressed. I have never climbed Misti, the volcano that dominates the skyline here in Arequipa, but I do want to climb to a higher position of praise and joy through the calm assurance of the Sovereignty of God. If we can look and view life from that position, where Jesus was, then we shall know the peace of God which passes all understanding. Praise him in the storm! Just recently we have had a couple of Baptisms. Firstly Ronny´s son Samuel, and then Clara the mother of Eddy (more about her later) who has been attending for some years. Eddy and Clara do all the cooking for the special services we hold. Pray also for her partner Herman who has requested baptismal classes. Samuel, currently studying civil engineering, plays the guitar in church. At some point in the future he wishes to study Theology. 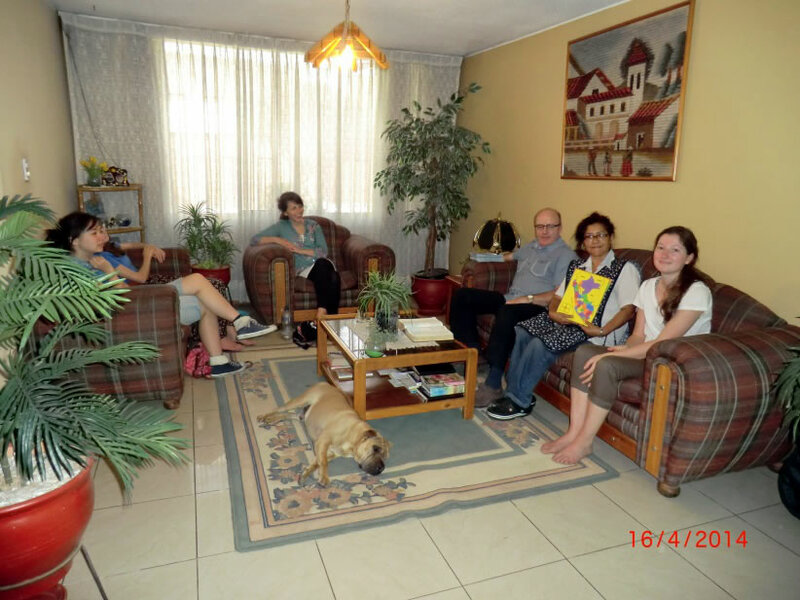 A Christian couple, Jerry and Charo, who are new to the area, have recently joined us and seem keen to settle. It would appear that they have come from a church strongly influenced by the health and prosperity aberration. Encouragingly they are both increasingly convinced over the doctrines of Grace, and so our desire is that they will settle well and serve the Lord alongside us in the church. They have asked for more one to one Bible studies, which I hope to start soon on Saturday afternoons. Another couple, Luis and Marianna have also requested both baptismal and marriage classes. Pray that we may wisely discern their current spiritual state, as we seek to explore their level of Bible knowledge and their experience of God’s grace in their lives. Transparency and openness are not so readily forthcoming in this culture. Recently all the legal wrangling over the change of land use for the whole estate, in which the church building is located, was finally settled. This dispute has been going on for nearly ten years, but our lawyer is now in the process of finalizing the paperwork for the Title Deeds to the church. The biblical admonition to wait on the Lord must have been prophetic with Peruvian culture in mind! A little while ago I was praying and fasting over a matter for a number of months, when suddenly while I was driving somewhere, I knew I had to cease from fasting. There is now no point; the prayer has been received and answered. It is in the post; wait for it, it’s on the way! That one experience blew away the storm and the dark clouds of unbelief. I’ve climbed a better mountain than Misti, and the view is much better and longer lasting! We continue to sow the seed of God’s word from Lucresia’s home. From there we run a children’s club on Thursday afternoon, and a family breakfast on Saturday mornings. Lucresia gets up at 4.00 am to prepare the breakfast, and to rouse her neighbours! It also provides some income for her and her husband; they often struggle to put food on the table. Joachin, her husband, has recently been out of work, so the support she receives goes some way to alleviate those times of hardship. The Saturday morning breakfasts mean we are reaching more people, and they are certainly more attentive to the preaching at that time of the morning. 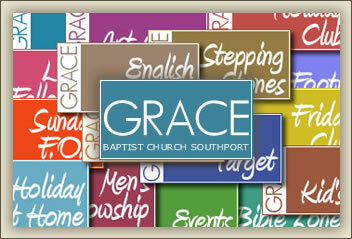 We have different folk coming each week, the only thing lacking is the spiritual harvest! We expectantly wait on the Lord that soon we will see conversions, so please keep praying. Often we are called upon to support families practically. Recently two of our ladies gave birth in the same week, so we were able to buy some clothes for both of the new babies! Pray for Dina, a lady who has been abandoned by her husband. She has three young children, and has often to leave her home in order to find work. Her children come to the meetings dishevelled as they are often left alone. Pray the Lord will be merciful and gracious to many such families in the area. There is no debate here about welfare cuts; those words aren’t even in the dictionary here! 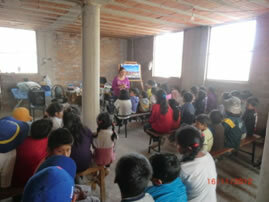 Ronny and Rocio continue with the children’s club on a Saturday afternoon and the Bible Study on Thursday afternoon. We have recently agreed to support Eddy, a qualified teacher and worker with the children, to start reading and writing classes with some of the elderly.. Many of the older folk have never received an education, so the purpose of such classes is to enable them, as far as they can go, to read God’s word for themselves. 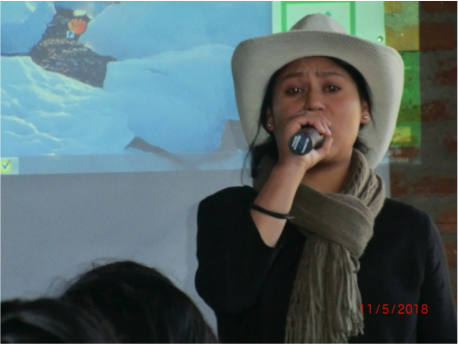 Tomasa, our eldest member and one of the first converts in the area, is a stand out student! Roxy became concerned that we were not doing anything for those members who cannot read. Pray that this new initiative will be blessed by the Lord and that He will grant them the ability to remember and learn more of God’s word. We have had a few visitors this year. First we had Daryl and Julia Jones from Grace Baptist Mission, and then a young couple, Michael and Stacey Sutton from our home church in Southport. The one thing we have here is clear skies almost all the year round, allowing one to observe the course of the moon every day. Recently, whilst out walking the dog, we had the marvellous sight of a blood red moon. 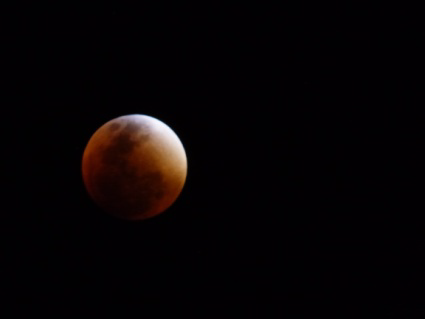 It really was a most glorious sight, causing us to contemplate our most Glorious Lord. The changing light and hue made for a spectacular sight, bringing many outside with their cameras! Our young visitors certainly had an interesting first day with us! I am sure that there in the UK you had the usual spectacular sight of clouds! Recently Melissa had a school outing to Columbia, the first time she had been away from us for more than two days; so ten days seemed like a loooong time! Next year will be her last year at school, and then on to University. Her desire at the moment is to be a veterinary surgeon. I wanted to her to be a chef, but she sussed me out on that one, and quickly declined the suggestion! We hope soon to renew fellowship with many of you soon, as we plan to be in the UK for two months, beginning late December. Thank you all again for your continued prayers and fellowship in the Gospel. After years of waiting, by Abraham and Sarah for the promised son the Lord spoke into a situation of barrenness and fading hope, God, in His own appointed time determined when Isaac would be born. The appointed time in Hebrew is: “the time of life”. Sarah’s womb and Abraham’s body were considered as dead. The birth of Isaac was of the Lord’s visitation, “the time of life”. The church often seems to be in a condition of barrenness and sterility, but could this year be the “time of life”, the year of the Lord’s visitation, the time when the church will blossom and sprout, and fill its community with fruit? As we wait the Lord’s time may we be enabled to sail, and not drift, or lie at anchor! May our waiting be with patience and trust! Last year we introduced some changes to the structure of our meetings. We started our Saturday mornings at 6.30am and with breakfast. We found that the folks were more alert and attentive to the ministry of the word after a warm breakfast, and at this early part of the day, before they go off to work. We will review things as the year progresses, but we seek to be effective in our outreach, as the Lord leads. We had a number of new families come to camp this year, so we continue to have growing and meaningful contacts in the community. May there be a “time of life” for some this year. We did have the joy of seeing one of the children make a meaningful and definite step to seek the Lord. A young girl called Soledad, stayed behind after all the other children had left the children’s club and shared her desire to receive Christ as her Saviour. As we talked and prayed with her it was notable to see the joy on her face after I prayed. Please pray that she will grow in faith, and that her parents will not oppose or hinder the work of God. Many of the children are not allowed to come to the children’s club after they have received confirmation in the Catholic church. However “He who keeps Israel will neither slumber nor sleep” and He, the Good Shepherd, will care for His own. Pray that the Lord will grant us wisdom this year regarding all aspects of ministry in this needy township. Ronny and Rocio lead the children’s meeting here, but last year was particularly frustrating for them as the community centre is now used frequently for various functions, where drinking to excess is the norm. The atmosphere in the place has become unfavourable, so they need to find a place they can rent, where they can have meetings without interruption. Pray that the Lord will provide such a place and soon. Maybe the time has come for us to bring together the believers who live here, so that they can meet regularly at the weekend, within their own community. We have bussed them into Simon Bolivar on Sundays for years; perhaps this is the appointed time to consider having a more permanent ministry, with their own input and support. Pray for wisdom as we work through this proposition, and for the Lord’s clear leading. 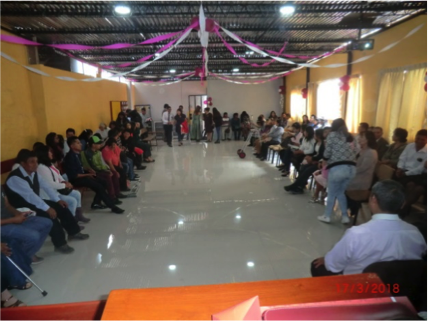 The normal activities and ministry in the church in Simon Bolivar have continued throughout the year. We had our camp this year at another site. It belongs to the Lutheran Mission and is closer to Arequipa. We had over 70 campers, with some new faces among the regulars! Pray for a man called Enrique who attends the church periodically and has enquired about baptism. We had a long conversation on spiritual matters; pray that spiritual fruit may be increasingly evident in his life. Please also pray for one particular couple who attended the evangelistic meal; Jeanna & John. John commented afterwards, that he must go home and give serious consideration to the message he had heard. I gave him a booklet to read, but we need to water the word with prayer. Pray for the unconverted among us, that soon a “time of life”, real conversions by the regenerating power of the Spirit, may become more evident in the church. There is a real threat of drought here in the city of Arequipa. We have had no rain for two years and there will be rationing if there is no rain soon. There is a daily growing concern among the population, particularly with the agricultural sector. But how many are concerned about the spiritual drought in the church?! The answer is, not many. The living epitaph can be written over all humanity, “there is no-one who understands, there is no-one who seeks God”. Rom 3.11. Pray that the Lord would pour out on his church the spirit of grace and supplication, the precursor for an increase of new and joy in his church. Please pray for the Holiday Bible Club in February, that the Lord will bless the hard work of all the helpers. Last year was like sailing against the wind, the wind of adversity in many ways. Roxy was ill almost the whole year, first with constant dizziness, a barrage of tests, and then two surgical interventions to remove a bladder stone. The good news is that now she is so much better, so we are trusting the Lord for a more active and fruitful 2015! We had a large gathering of family and missionaries at our home for Christmas. Yours truly cooked a chicken curry for over 20 people! I am not a traditionalist, it beats turkey any day! There must be a reason why nobody eats turkeys during the rest of the year! Melissa is off school until the beginning of March, but we are keeping her busy with various activities, classes, swimming, music, dance, etc. For me, I have been pummelled relentlessly in the fight, but although at various times I’ve been on the canvass, by the grace of God I kept getting up to go the distance, never to be counted out! But my enemy and his cohorts will not go the distance, rather they will receive the eternal knockout, at the APPOINTED TIME! Thank you all for your support and prayers for us as a family and for team here, in the work in Arequipa. May the Lord grant you a most blessed and spiritually prosperous 2015! Since our Spring Prayer Letter, when we reported on the encouragements received from the Envision team, we have been largely taken up with concerns over Roxy’s health. Shortly after the team moved to Lima, Roxy began to experience dizziness and other symptoms, which required us to seek urgent medical help. As many of you know, Roxy suffers from high blood pressure which flares up from time to time. This time however the symptoms gave us real cause for concern. We were able to seek advice from a trusted consultant who, thankfully ruled out anything sinister, but who prescribed a form of medication that induced complete rest. This course of medication was followed for a few weeks but the side effects were considerable, so we gradually reduced the dosage and were encouraged to see a degree of more normal health returning. We praise God for His goodness to us thus far. The degree of improvement experienced enabled us, as a family, to have a weeks holiday, north from here at a place called Tarapoto. We still do not have a formal diagnosis but there is some talk of reduced blood flow, due to living with long term high blood pressure. As part of our review of the work generally, and in order that I might attend the pastors’ fraternal in the city on a Friday, we have decided to move the children’s club at Villa Magisterial, to a Thursday. Please pray that this change will not affect attendance and also that I will be encouraged through meeting with other pastors in the city. Also we have introduced a Saturday morning family breakfast meeting, commencing at 7.00am. The idea is to reach more families with the gospel at a time when they are more likely to be alert! For most unconverted people, Sunday is a work day just like any other day. Also, preaching to tired minds, after a long day at work, is not the most efficient way to proclaim good news! In the area of the city where the church is located, a high proportion of children are undernourished so we hope that we can reach whole families, offering good food for both body and soul! Pray that the members will be energised to invite unsaved neighbours and friends. Many live within easy walking distance of the church building. We are looking and praying to the Lord, that in time, we can strengthen the leadership at Simon Bolivar. We need more workers (men gifted in leadership and teaching), preferably from within the existing membership, but not exclusively. We are so grateful to those who, in more recent months, have renewed their commitment to us, whether in prayer or through their giving. Without your support, especially in prayer, we can achieve so little. Our goal is to glorify the Lord’s name in the church, the family and in the community. Through your prayers, and by God’s grace we trust we can fulfil all three goals and through them see many more souls won to Christ and thus see His church grow. Doing everything I can to save some! An old Chinese proverb says “ a journey of a thousand miles begins with a single step” We can take such small steps by setting aside some traditions and trying new things to reach people with the Gospel. We may not see immediate results, but by the Grace of God such initiatives may be the first step on a journey that will lead some to salvation in Christ. We need to adapt and consider new ways in which to meet and relate to people in the community. “Cold evangelism”, which is word based only, lacks the relational, often not connecting or relating well with others. Building meaningful personal contacts affords a better platform for the gospel to be heard. Recently we tried something different for an extended period: eight sewing classes with a number of women from the community. I am not a “crafty” person myself, but it was an opportunity to create the conditions and atmosphere for people to meet and get to know each other, building warm contacts in the community. Two new singers side by side! Last month we had the GBM Envision team with us for four weeks. We worked hard at using their talents and experience to create gospel opportunities here in Arequipa. We had four young girls with us, one of whom was Fiona, a seamstress for a small business that designs and produces costumes for dancers across Europe. Recognizing her considerable talents gave us the idea to organize sewing classes in Villa Magisterial. We were able to gather a group of ladies from the community and during our times together they made dresses and trousers, and some clothing for children. Each meeting concluded with testimonies and a short evangelistic message. 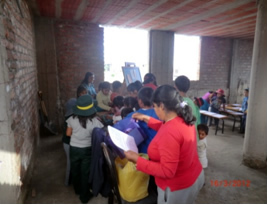 These classes provided the opportunity for the ladies to spend many hours working together. They would cut cloth and also learn how to use a sewing machine, and over the period we observed how much they appreciated attending, learning, and enjoying the final results of their handiwork! Lucresia was very encouraged when some of the ladies asked how they could go on to know the Lord. It’s early days yet, but we pray that this contact will bear fruit and be the first step to some of these ladies coming to a true faith in Christ. This evangelistic outreach also provided a real impetus for restarting the adult meeting on a Sunday afternoon. Pray with us that these times of communal fellowship will encourage the ladies to regularly attend the meetings. One of the ladies came with her husband, José, on the first Sunday after the classes; pray with us that we will see real sustainable growth as we meet regularly during this year. May this first step be a journey that leads some to Christ; the desired end for all activities here in Arequipa. Pray also for Sonia, her sister had an accident and died during this period of outreach. Pray that the testimonies and messages she heard will cause her to give serious consideration to the brevity of life and judgment to come. 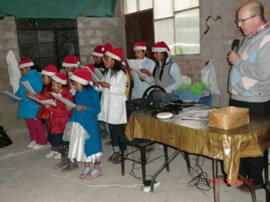 The girls also helped with the worship in the church at Simon Bolivar. Megumi has been a choir and orchestra leader at Queen Mary University, London, so the folk here appreciated the sweet harmony as she played her violin alongside myself on the guitar! They also baked cakes for the women’s meeting, helped in the various children’s clubs, and took part in the service at Villa Magisterial on their last Sunday. 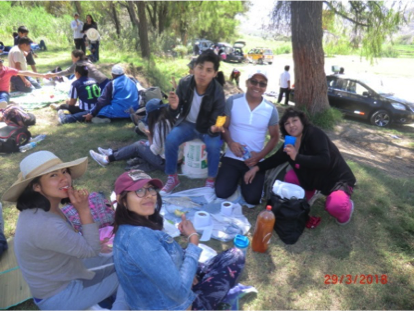 In addition of course, they also enjoyed the constant sunshine of Arequipa, as well as its culinary delights! It was a joy for us to have this team; they had an evident desire to serve the Lord in various ways. They were even asked by a lady in the church to sing at a relatives wedding! That was not on the schedule; but typically Peruvian; last minute and improvise! They spent time with the children in all areas, and also with both Ronny & Rocio, culminating with a nice barbecue to round off their stay. Alfredo’s wife, Suzanna recently underwent surgery. Whilst in hospital we visited her a number of times and exhorted her to seek the Lord during this period of difficulty. Pray that this recent providence will awaken her to a deeper walk with the Lord. A young lady called Katty, who used to attend the Sunday school as a child, was also in hospital with an infection. In her case there seems to be a most evident change. She has openly repented of her sin and was at church the Sunday following her release from hospital. She has expressed her desire to serve the Lord in the church. Please pray that these initial signs of grace will deepen and that she will be given sure evidence of her salvation by the inward testimony of the Spirit. This is what we long to see, a real work of grace in people’s lives, where they will be able to say, without prompting, “the Lord has saved me”! Pray for couples that attend the fellowship, that we shall see in them a greater desire to serve the Lord in the church. Truly the workers are few! Pray that the Lord will raise up workers and diminish the shirkers! We need above all else the power of the Spirit upon the ministry of the word, so blind eyes will be opened to see the Glory of God in the face of Jesus Christ. It is said that, while Charles Spurgeon preached to huge crowds in the Metropolitan Tabernacle, the basement prayer room beneath the pulpit, was filled with some 200 praying people, and he affectionately referred to this room as ‘the fire room’. What we need is Holy Spirit FIRE. If you forget all the other points, don’t miss that one, and put it at the top of the list! Pray for our health and strength as a family. We desire to show as much hospitality as we are able, and use our home to encourage others in their faith. May all these little steps we are able to make on our short journey here, lead to the salvation of many and all to the Glory of God. We thank you for your interest and continued support for the work here in Arequipa, as we all seek to do everything we can with the intent of saving some, and may the some be an increasing sum in the coming months! There was no mercy for the prophets of Baal, the cancer mercilessly cut out from the body politic in a day; nothing spared. But there was no going up to Carmel until that merciless work was fully completed. The principle is clear for us too see: sin must be dealt with before grace can rain down from above. With the evil removed the way was opened for blessing. We remember the glorious truth that a crucified, resurrected and reigning Christ has sent the promised Holy Spirit to gather his elect from the four corners of the earth. Elijah´s servant looking toward the sea said “there is nothing”, but the three and a half year drought had to give way to an abundant outpouring. Praise God we can and must come before the Lord with the same confidence and assurance as Elijah, to persevere in prayer. Sin and evil has been atoned for and removed. We may also look sometimes at the work and think “there is nothing” but faith perceives and perseveres until the promised blessing is poured out upon his people. Satan would also whisper to us “there is nothing”. But a cloud as small as a man´s hand is seen rising from the sea, and Elijah knew there was much more to come! Can we say and pray with the same confidence, that there is so much more to come regarding God´s Kingdom? A recent article in our local paper stated that sexual abuse towards children and teenagers had increased by 40% over the last year, and that violence towards women had also increased significantly. With us working predominantly among the poorer class of society the fractured nature of family life is also reflected in the church. However, the Gospel can reach those affected by such trauma. For example a lady who attended this years camp for the first time, with her husband and young child, recently asked to speak with Ronny and myself after the service, together with her husband. Well, a man who we thought was her husband! It had come to her knowledge that he was in fact still legally married to another woman! There are many other sad issues that I cannot relate here, but suffice to say that we were confronted with something that is a common occurrence here, and as the worldly vernacular would say, “shacking up together” without any sense of commitment, especially from the male gender. I can think of 5 women who attend the church who are in relationships where they receive no support from their spouses. Also in other families the only word that would describe their homes would be ‘fractious’. One lady called Gladys, who attends the Sunday services in Villa Magisterial shared with Roxy that her partner had recently left her. She has two children and in desperate need of an operation to save the sight in one of her eyes. Another lady in VM called Angela, whose children attend the children´s club on a Friday, works all the hours she can to support her children. Her partner recently came out of prison due to the violence she suffered at his hands. Of course of ourselves we cannot mend such brokenness nor can we change the circumstances of their bad choices and decisions, but we do know that real change can only come through the powerful work of the Holy Spirit through the new birth. Nothing but a new heart can bring about conclusive change, transforming people´s lives. Pray with us that the Lord will be gracious and bring about this miracle of grace, which alone can bring salvation, and transform many of these families. We are encouraged by seeing new faces in all the areas where we are serving the Lord, but the great need is for a spiritual stirring among the unsaved. Please pray for Davíd & his family. A month ago he left the church seemingly through conviction but has recently returned! He has even asked for baptism! Ronny knows the family and will be meeting with them on a regular basis. He is an engineer who works at a local mine, and would be the only sizeable “earner” among us. They helped recently with preparing the food for the anniversary service, which was a real encouragement. Lucía is a lady who seems near to the kingdom. She was near death after an unsuccessful operation, but thankfully came through and has expressed her desire to serve the Lord. Her husband is a drinker, who spends more time with his worldly pals! Pray that these individuals will come right through to a full knowledge of God´s call to salvation in Christ. At Villa Magisterial we have a number who are regular on a Sunday. Recently a couple of the ladies have come with their husbands to the main service on a Sunday afternoon; Patti & René: Mari Luz & Owen. Pray for these couples and the others who attend, that the Lord will save married couples and that we may soon have a group of believers there to be a living witness in the community. Ronny leads a Bible study on Thursday, in the local community centre in San Pedro, with a number of members of the church who live in the village. Pray also that the Lord will prosper all the ministry to the Glory of God. Pray for all the evangelism, and for the various children´s meetings in all these areas. How we need to see a new generation with biblical principles instilled in them, by the Spirit, from a young age. Dust clouds, gales & rain! Never seen rain in June, and never seen gales in Peru! But have them we did, which made for a most unusual day! Roxy was in a panic, and all I could say was, “Call this a gale; you want to live in England!” I was a real calming influence! Then came a power cut; total darkness and me fumbling around to find the torch; now i´m worried about her blood pressure! I slept like a log through the whistling and sound of flying debris, while Roxy was up and down like a yo-yo (so she told me)! Flights were cancelled and Melly enjoyed a day off school! We would value prayer for the visits to us over the next few months. Fiona Cary from the church in Formby, Merseyside, will be staying with us for a number of weeks. She will be helping Megan Addison in the orphanage and also assisting us in the children´s ministry, in all areas. Trevor Condy from our home church in Southport and David Rivero from the church in Madrid will, DV, be visiting us in September. Pray that their ministry to the church will be fruitful, and that they also may be blessed and encouraged by being with us. I also need to travel to Lima a couple of times to change the category of my visa, due to the uncertainty regarding religious visas. Being married to a Peruvian I have the option of changing this status to that of a family resident. Pray that the whole process will go ahead without any problems. Pray that I will have a good dose of heavenly patience! I still find it hard to bear incompetence and irrationality in many of these matters. You can fulfill all the criteria that they ask for on the website, and then when you get there, they make others up! It often boils down to the individual person. Pray I may get a nice one!! 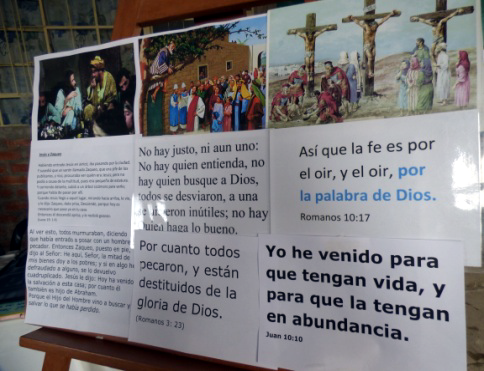 We take the opportunity to give thanks to the Lord for your support and prayers for us in the work here in Arequipa. May the Lord be pleased to extend his kingdom among us all to the glory of His name. But he knows the way I take; when he has tried me, I shall come forth as gold. There is great comfort in knowing that God has predestined and ordained the path set before us. There is no possibility of getting lost along the way, due to the adverse and foggy path on which we often walk. Peace and rest is assured because he knows the way, and his destined purposes will be realised; we shall come forth as gold, we shall be transformed into the image of his Son, Jesus Christ. What will be the way for us this year? However it may be, we can rest in the knowledge that God will guide and continue to work in us, according to his good pleasure, as we humbly submit to his will. As we begin the year our hope is in him and trusting his promise to build his church for His glory alone. We had a good camp this year with a number of new faces, including some from our outreach to Villa Magisterial. We had a married couple, Isaac & Patti. Patti has been attending the women’s meeting. They are regular in attendance on Sunday and just recently Isaac has begun to attend the mid-week prayer meeting. Also Jessica, one of our young women testified that she had backslidden, but now wanted to return to the Lord and commit herself again to the church. She has been to church regularly ever since. We also had a number of young people with us, many of who are also with us on a Sunday. Please pray for all these individuals that the work of God in them will be deep and persevering. Unlike the Lord’s complaint, through the prophet Hosea concerning Israel’s loyalty “For your loyalty is like a morning cloud and like the dew which goes away early” (Hosea 6:4) Pray that they won’t gradually be like the seed being choked by the cares of this world and drift back into sin, but rather pray that they will flourish, grow in grace and contribute to the life and fellowship of the church. Pray too for a lady called Gladys who, at the invitation of her sister, came to camp with her young baby and gave testimony on the final evening that, just a week before camp, her husband had suddenly died from a heart attack. 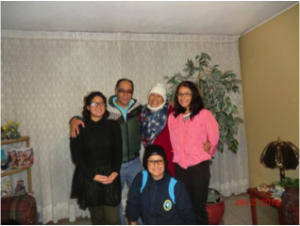 She lives outside the areas in Arequipa where we are working so please pray that we will be able to locate her and maintain contact and have opportunity to share the word of God. We started a family service here last April, and during the year had around 15 in attendance but never all together! A few came to camp, but we would ask you to pray that this would be the year when we see a number coming to faith in Christ. At the end of year service for the children’s club, we had over 60 children and parents present. Pray that this year’s visitation and evangelism will result in the Lord planting a group of believers, and a new church established in the area. We have already had a number of opportunities to build relationships, which we pray will bear fruit as we continue to share the Gospel with these people. 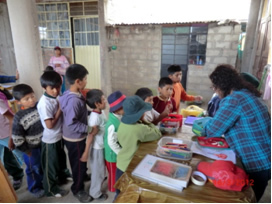 The past couple of months have been particularly uncertain regarding the status of Missions here in Peru. We have been a legal association in Peru since 1999, and registered with the Justice ministry since 2004. This latter connection is very important as it means we are a recognised Evangelical denomination, as far as the Government is concerned. However recently, this status has been threatened by various changes in the law affecting different denominations, aside from the favoured Catholic Church; the Vatican State of course has favoured status, having diplomatic relations with Peru. Recently all denominations had to re-register with the Justice Ministry and those not complying by the 18th of January would be removed from the list. We recently registered again, which is not an easy process, and we still await the outcome. There are other proposed changes that could make it impossible for foreign missions to comply, so please pray with us that these problems will not result in our visas being withheld. These intrusions also cost time and money. Pray that sense may prevail, and that these silly and pointless changes will be dropped. I write this just a few days before we take our summer break as a family. February is a time for all of us in the work here to take a welcome break, before all the work recommences, coinciding with the start of the school year at the beginning of March. Pray with us that, during this time of rest and meditation, the Lord will grant us wisdom, discernment & an understanding of his will for the work, going forward. Pray for us as a team during this year, that we will be united in heart and mind, and that God will bless us together as we seek to reach needy souls with the gospel. Someone once wisely said concerning ministry, “It is not the hard work that breaks down ministers, but it is the toil of working without power”. May the Lord grant us the oil of the Holy Spirit so that our ministry will be eternally effective in saving sinners. We would take this opportunity to thank you for your prayers and support. May the Lord grant us all the joy of seeing his kingdom come in the lives of many, and for his glory. There is a spiritual chill that has come over us…! I recently read a letter of John Newton’s, where he described our walk with the Lord as passing through seasons. Storms and frosts are useful and seasonable in their places. In our dark and dull hours we feel how little we can do for him! He comments: “The work seems (so far as it comes under my knowledge) much at a stand-still as to new awakenings and conversions; I trust you will pray for us, that the arm of the Lord may be revealed” Truly, I can echo his words and share his experience! Yes, dark and dull hours, a spiritual winter, where the ground is hard and there is no visible evidence of the power of God in salvation. But we are assured his presence is with us, and is sufficient to comfort in storms and trials. Why his power is withheld and restrained at this time is known only to him who dispenses his gifts and graces where he pleases; but we pray that a spiritual “Spring” may soon arrive to refresh our spirits and revive his church. The first 6 months in the new area have been encouraging in the sense that a number have responded and continue to attend the service on Sunday afternoon. There are 4 couples who are listening to the word of God regularly, and appear to be attentive to what is being preached. But of course the attentiveness we long for is that which can only be created by the Holy Spirit; listening with faith and confidence in the Lord and in his revealed word. The bible is a closed book until the Lord is pleased to awaken and grant understanding of his will. Pray that faith would spring forth by the power of God in those who listen to the word; and also among the children on Fridays. We would value your constant intercessions for the following by name: José & Lourdes, Marta & Nestor, Berta & Rubén, Lucresia & Joachin. We meet in Lucresia´s home, and her husband is always in attendance. He is interested but as yet showing no evidence of stirring or spiritual life. But these folk and other ladies are all coming, which we pray will be a sign of future blessing. One lady recently stopped attending through the opposition of her husband. Pray that soon we will see the Lord moving among us and establishing a group of believers in the area. 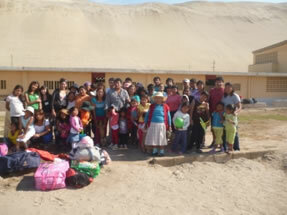 All those who are coming are parents of children from the children´s club each Friday. Pray also for the visitation in the area, that we will continue to build up contacts and have opportunities to share the Gospel. There is a great need among us as a fellowship for deeper commitment and service to the Lord. It is always very humbling to realise that of ourselves we can do nothing to increase power and spiritual life in the body of Christ. We are not only reliant on the Lord for the work of conversion, but also for the on-going sanctification of the Church. A.W Tozer once said: We pursue God because and only because, he has first put an urge within us that spurs us to the pursuit. The text above reminds us we are no less dependent on his power than when we first believed. There is a spiritual chill that has come over us, evidenced by a lack of zeal and a lack of power in the preaching. We may remember what the Lord said in the parable of the wheat and tares: “An enemy has done this” (Matt 13:28) As Oliver Cromwell once said to the master painter doing his portrait “ paint me warts and all!” so, we must share both our joys and concerns. The one thing needful is the day of his power, without that we can relate to you only church activities. There are a number of families passing through various trials, pray that these will not weaken, but rather strengthen their faith and hope in the Gospel. It is often other family members who are the cause of their trials, and we know that the enemy is most subtle in diverting the mind away from the Lord. Pray that the burden and desire for prayer will increase; at the moment the level of concern for the Lord´s intervention does not indicate any move of God among us. Pray for the unsaved among us, and for us who preach. We should be broken and humbled by fruitless Sundays. May the Lord turn the wilderness into a fruitful field. Will he not keep his vineyard? ”..I, the Lord , am it´s keeper; I water it every moment, so that no one will damage it, I guard it night and day” ( Isaiah 27; 3) Thankfully I don´t have that burden, although I often carry it when I should just hand it over to the true keeper! Megan Addison is due to arrive here in Peru on the 24th of September. The first need is to process her visa, which is likely to take initially a couple of days stay in Lima,then another visit to pick up the visa card a month later. Pray that the whole process will go smoothly; things rarely go smoothly here! Talk bureaucracy, and you are talking time, constant change, and the need of a good dose of patience! Megan will be helping for a couple of years in an orphanage here in Arequipa, and also be involved in the church as time allows, when her full course of language study is completed. There are also serious concerns regarding changes to the number of missionaries required to form a religious association. The proposed change is that the minimum requirement would be 120 members. Bearing in mind no foreign Mission has that many missionaries, none would be eligible for visas. Pray that the Justice ministry will see sense and shelve such nonsensical ideas, and that the unseen forces behind such changes will be frustrated.